Last weekend I decided to visit an exhibition at the National Gallery of Victoria entitled ‘suburban’ by artist, Ian Strange. According to David Hurlston the exhibition features a range of photographic work and installations that explores the artist’s personal experiences with suburbia. Strange deconstructs the notion of suburbia and family life through a unique and extraordinary collection; the photographic works features a range of dilapidated houses that display notions of decay and disintegration, there are some houses on display that have been painted in black or red and there is one house in particular that has been completely burnt to the ground! As I continued to walk throughout the gallery space, there was one photograph in particular that immediately captured my attention. 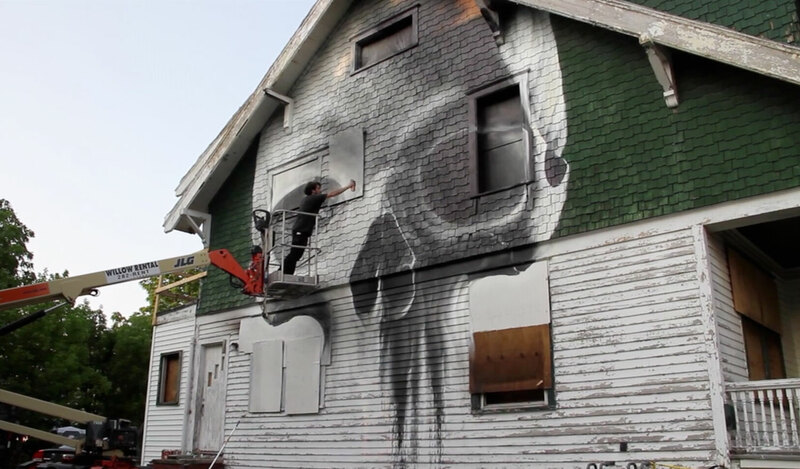 In “Tenth Street, 2011”, Strange has painted a skull onto the very side of a house and the style appears very similar to graffiti or urban street art. I do find Strange’s subject matter particularly fascinating, I began to question the relationship between death, destruction and middle class suburbia. According to Suzanne Frazer from the Melbourne Review, Strange deliberately sets the house on fire that becomes apart of a video installation, Strange effectively captures the orange flames in slow motion that begin to destroy the skull on the very side of the property. The video installation reminds me of death in a way, the flames remind me of decay and disintegration. 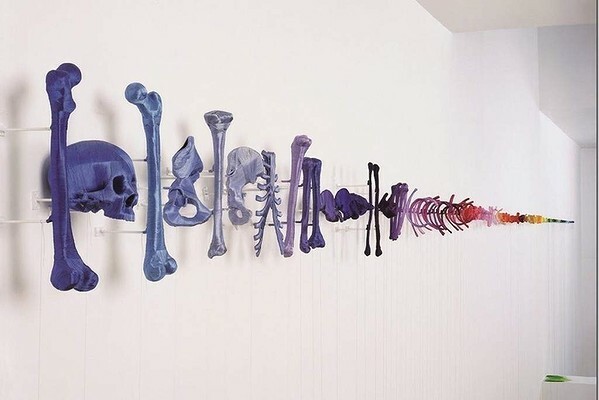 This makes a very interesting parallel with the skull the actual process is rather fascinating, to actually think that this extraordinary work of art is destroyed to the extent where the actual foundations of the house dissolve into black ash. To be honest it’s a remarkable idea, Strange has used the house as a canvas that becomes a pure form of artistic expression, the video installation in particular does resonate feelings of isolation and disembodiment, even the cinematography was well executed! The video installation was definitely my favourite, the visual and the audio effects are quite unsettling to start off with, the video piece reminded me of a horror film especially with the dark undertones. The installation did add a level of suspense that was rather enthralling, when I visit an exhibition I don’t normally watch the entire footage, Strange’s video piece on the other hand managed to captured my attention from start to finish! The video installation also features a house slowly burning into flames; the slow motion does emphasise a significant amount of detail especially within the orange flames that gradually drift into the open air. The video piece does have a unique style and composition, in a way I do find the fire aesthetically pleasing, for some strange reason it was actually quite relaxing just to watch the house slowly burning in the open field. The open fire instantly reminds me of decay and destruction, the idea that nothing in life lasts forever. 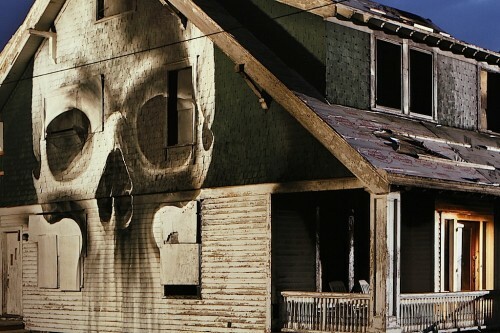 This is the very reason why I am interested in the skull that was painted onto the side of the house, the video installation does feature the skull slowly burning into flames, in a way the documentary reminds me of death. 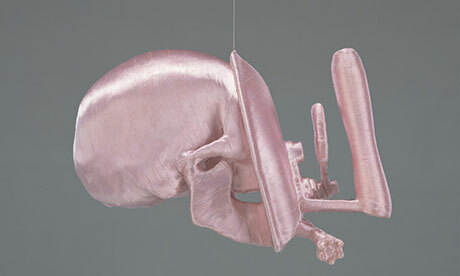 As soon I as viewed Strange’s extraordinary video piece, I imagined a body, even a corpse slowly burning and disintegrating to the extent where there is nothing left what so ever. It quite a strange thought really, although the artist’s work definitely triggers an emotional response! 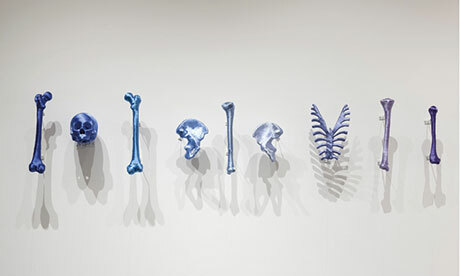 If you have the chance, I definitely recommend visiting Strange’s exhibition that is currently exhibited at the National Gallery of Victoria, well actually the exhibition is currently located within the NGV Studio that is opposite Federation Square in Melbourne. Strange has used a range of properties or house’s for an artistic and innovative project that would be impossible to miss! 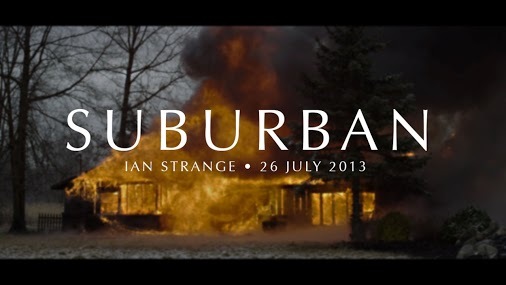 In fact Ian Strange’s ‘Suburban’ is one of the most original exhibitions that I have seen so far, the installations and the photographic works on display do create such a remarkable composition that will encourage you to explore your own personal perspectives in relation to middle class suburbia. If you’re interested in contemporary art, photography and digital media, then Strange’s most recent exhibition is definitely worth the visit! 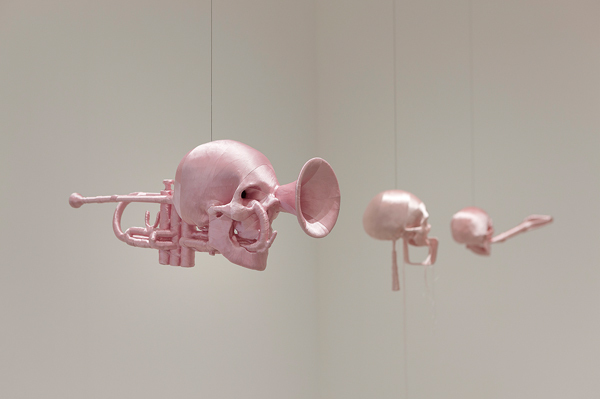 Hurlston, David, Suburban: A New Body of Work by Artist Ian Strange, The National Gallery of Victoria, 27 July – 15 September 2013.